This week, I planned well and put stuff together Sunday night for lunches. I baked a batch of cheeseburger muffins which should last a few days for the kiddos. Shaun has one right out of the oven and the response was favorable. 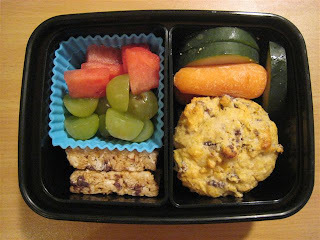 So for lunch, Miss Faith had a cheeseburger muffin, carrots & cucumbers, watermelon & grapes, and a granola bar. She informed me that the ends of the cucumber tasted "funny" so now I have to figure out why. Cute! What's the recipe for the cheeseburger muffins? Maybe it's the skin on the cucumbers?